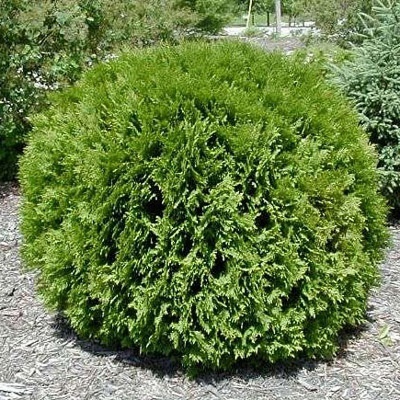 The Arborvitae Woodward Globe is a compact – medium sized evergreen shrub which maintains a broadly round shape. It has a spray of fine textured lacy foliage that is rich green and turns to a shade of brown and green during winter. The Arborvitae Woodward Globe is scientifically known as Thuja occidentalis 'Woodwardii'. This type of evergreen shrub at maturity grows to a height of 4’ – 10’ feet and gets to a spread of about 8’ – 15’ feet. The leaves are fine-textured, a lacy foliage that is light green above and pale green below. The Arborvitae Woodward Globe will flourish where no other evergreen shrub can; it spreads a lush screen of foliage that can provide privacy or shelter to the birds during the winter season. There are many dwarf varieties available as fillers and also vertical accents for the smaller gardens. Arborvitae Woodward Globe will prosper in deep cultivated, yet moist and fertile soil and in full sun. This specie of shrub blossoms in the spring with flowers that is yellowish in color. Arborvitae Woodward Globe is drought tolerant at the same time it is deer resistant, it can be used as fence as it is good for privacy. The shrub is also popularly used in slope or erosion control. The Arborvitae Woodward Globe has a low maintenance and easy to take care off. When Arborvitae Woodward Globe is planted for home use it should be watered every day for the first week of planting. For established Arborvitae Woodward Globe, it can be watered 2 times in a week. The trees do not require much watering except during the drought seasons. The Arborvitae Woodward Globe when planted for home use they can be fertilized once every three weeks. Pruning should also be practiced once in a while to size and shape it up as needed.